The Junior Bruins, Islander Hockey Club, Jersey Hitmen and South Shore Kings have announced the formation of the United States Premier Hockey League (“USPHL”) to provide a new national opportunity for hockey at the Junior and 16U/18U Midget Levels. The USPHL Organizations share a common commitment to the fundamentals of USA Hockey’s American Development Model (ADM) and its Long Term Athlete Development (LTAD) initiatives based upon age specific development of hockey players and will have all participants in the league register under USA Hockey. The USPHL founding members have each developed a complete player development model where at present over 2,000 boys and girls train, compete and enjoy the sport of ice hockey. These programs go beyond the on ice experience to include education, leadership and community service components to help foster a complete student athlete. The member organizations believe the USPHL will provide the next step in high performance training and competition and will provide unmatched exposure to NCAA hockey programs for young aspiring hockey players. The four organizations will maintain teams in their existing youth and junior leagues including the Eastern Junior Hockey League. The league will commence competition in September of 2013 with 16U/18U and Junior divisions. Applications for each level are currently being accepted and can be found on each organizations website. 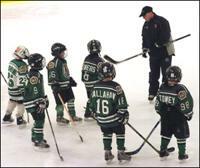 The South Shore Kings have a tradition of AAA hockey excellence for over 25 years. They are members of the Eastern Hockey Federation, The Eastern Junior Hockey League and The Empire Hockey League. These leagues are the some of the most competitive youth hockey league programs in the U.S. The Kings have an ongoing commitment to providing the highest level of coaching available in New England with a program that is a rigorous preparation for High School and College Hockey. Kings players are prominent and much sought after members of top level high school and college programs throughout the Boston area. ©2019 Foxboro Sports Center / SportsEngine. All Rights Reserved.